2.00mm diameter to 65.00mm diameter. 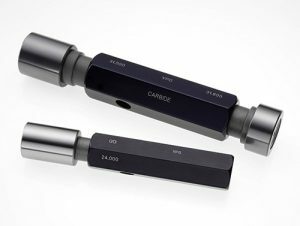 The wear resistant properties and super smooth surface finish of Tungsten Carbide are an ideal option where precision gauging is required in an arduous manufacturing environment where the use of tool steel could result in premature gauge wear. YPG Gauges are manufactured to BS969 – 1982 using the component hole tollerancing as the basis for determining the gauge manufacturing tolerances. In addition, gauges can be supplied to DIN and ANSI standards. Pin gauges are manufactured from solid, specially formulated, cobalt bonded tungsten carbide. Taper-Lock gauges incorporate a tungsten carbide sleeve between 5mm and 10mm thick dependent on the gauge diameter. • Extended length gauge members. • Air Release flat on the Go member. • Handles can be marked with customer specific information.